I have another novella to tempt you with this week. Nik Korpon brings his neo-noir A game to the Gutter with Old Ghosts. Some things are best left in the past, but like Willy Vlautin said. “There is always that dream of escape, but there is no place to escape to, you just run into yourself.” That’s certainly true for Cole. The life he was living in Boston nearly killed him. His time there ended with a knife in his guts and a plan to start over. Now, he is settled in Baltimore, working construction and trying for a family with his wife, Amy. Cole is still haunted by the ghosts of his past and when his former partners in crime, Chance and Delilah arrive in town, he finds himself struggling to reconcile the loyalty he still feels towards old friends and lovers with the new life he has built to replace them. The choices Cole is forced to make will affect a lot more than just his own future. Old Ghosts doesn’t throw it out there from page one; you have to ride along for a while to find out exactly where the story is taking you. At times the introspection of the protagonist slows the journey, but his moral tussles are central to the plot and the pull of his old allegiances is used to good effect to provide the narrative with emotional depth. Nik Korpon’s renowned atmospheric style is much in evidence here. The lyrical quality of his prose is compelling and raises this novella way above a standard noir-by-numbers offering. 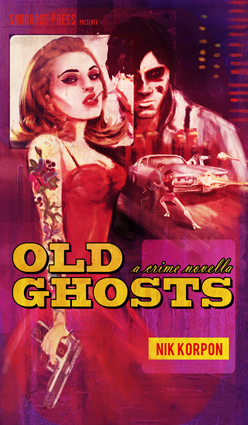 Old Ghosts is easily devoured in one sitting, but will likely remain with you for a good deal longer.